No game plan, no ideas, and most importantly no accountability. When the FA in their infinite wisdom permitted Sven to stay on for the World Cup (but no longer) they effectively gave him a 'free option' to impose his perverse ideas on the team. After about an hour of humiliation, I found myself urging Trinidad to score in the hope that Sven might do the decent thing and surprise the football world by resigning mid-tournament. As it was, the country of fifty million eventually overcame the country of one million, and we limp into the next round from surely the weakest group. At least he had the wisdom to realise that adding a bit of pace and width in the shape of Downing and especially Lennon might actually begin to open the game up. Playing Joe Cole on the left makes the job of the right-back too simple (just show him the outside). As I mentioned in my last post, we have a habit of overestimating the abilities of the likes of Cole and Lampard because their teammates provide the pace that they so clearly lack. Put them alongside the lumbering Beckham and the deep-lying Gerrard and we are easy to defend against. Listening to the Baddiel & Skinner podcasts this week, it was notable that Daniel Finkelstein (author of the 'Fink Tank' column in The Times) had concluded that statistically Peter Crouch was the 311th 'most' effective player in the Premiership last season. My first reaction was 'I didn't think he'd be that high', but then Finkelstein confirmed what we all knew....Darren Bent should be in Germany. Indeed, by their quantitative estimations, Bent was the most productive English striker last season (not just in terms of goals), and amazingly even more so than Rooney. 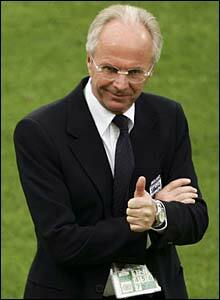 Still, as Basil Fawlty would have said to Sven, "...you know best dear." Meanwhile the pathetic performance of Owen and the notable absence of Walcott makes you wonder again how Sven can justify his squad selection. Before the tournament we were told confidently that Walcott's pace could terrify defenders, so what type of match situation was Sven waiting for? Just about the only silver lining (other than Rooney's introduction) is the consecutive clean sheets though the defence will be more severely tested by Ecuador, or more likely Germany. I've never really understood where this idea that we were genuine 'second favourites' for the tournament came from. Surely it wasn't our prior record in major tournaments, or our stop-start emergence from another easy qualifying group? We are too one-dimensional and too predictable - Rooney aside, we have no loose cannon or spark. Elsewhere thankfully as an overall spectacle the likes of Spain, Ecuador, and Czech Republic are reminding us what the 'beautiful game' really means. Just got back from the pub, and very well summed up NYA. Haven't seen any decent games yet! Lennon was worth watching - but will he get a start v. Sweden? - Or 'Same old Same old"
They are really reminding me of last years' Charlton (team and coaching wise). If not Billy, then who?